Digital Dental X-Rays allow you to get necessary care without unnecessary radiation. 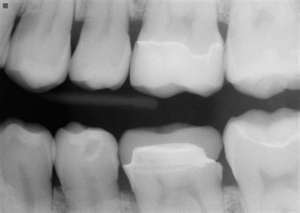 X-rays play an invaluable role in the diagnosis of dental problems. But many people are concerned about the exposure to x-ray radiation. Computerized Digital Radiography (CDR) eliminates these worries because it requires much less radiation than conventional film x-rays. This is especially important for our pediatric and pregnant patients. Digital Dental X-Rays are as accurate as conventional x-rays—and reveal things film simply can’t. The CDR image can be magnified 300x its normal size to enhance diagnosis, manipulate to correct contrast, and color-adjust to reveal hidden problems before they turn into major issues. With Digital Dental X-Rays, we spend more time treating and less time processing. CDR images are instantaneous. No time is wasted processing and mounting x-ray film. So the dental staff spends less time in the dark room and more time with you our valued patient, discussing your oral health. With Digital Dental X-Rays, there is no harmful waste. Our CDR system uses no film or chemicals, so we don’t have to worry about disposing of hazardous processing waste, which is better for the environment. Additionally, CDR x-rays are covered under your basic x-ray benefits, so there’s no reduction in your dental insurance benefits. You get safer, better, faster, smarter service without the usual increase in price. Its just another way that Stanley Dentistry has been able to go above and beyond in providing our patients the very best in dental care. Whether you need to see a specialist or surgeon or you decide to change your dental provider, transferring your dental records can be a pain. To transfer traditional x-rays, copies must be made and mailed to the new provider. With digital x-rays, the digital files can be sent by email, allowing your new provider to review the information immediately. No one likes to spend his or her day at any appointment, let alone at a dentist office. With traditional x-rays, you have to sit through the lengthy x-rays and then sit around waiting for the film to develop. With digital radiography, your x-rays are available almost instantly; you will be in and out of your appointment in no time.